So I speak enough Spanish to know that quesadillas contain cheese. These do not. But the concept is the same, so I’m cheating a little! My third (and not final, one more Monday) Cinco de Mayo offering are these easy dessert…quesadillas? 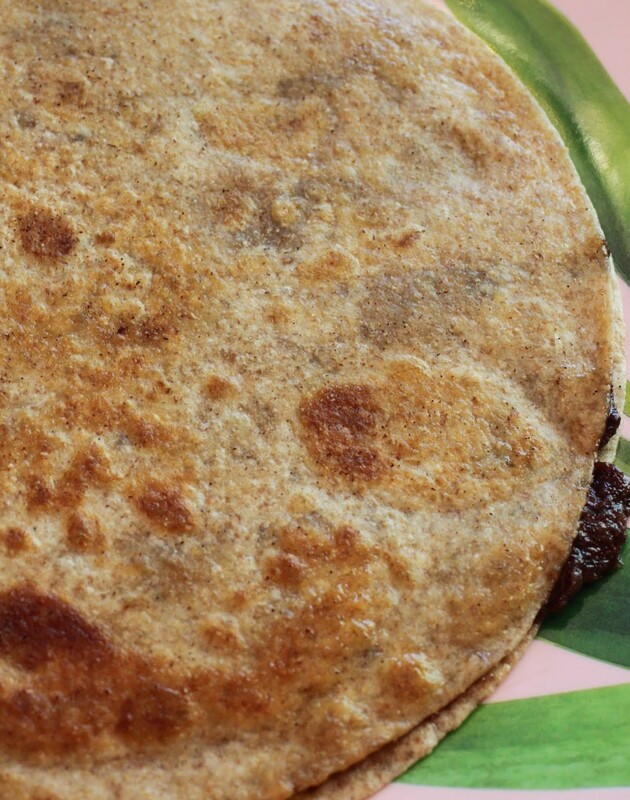 Tortillas with a rich cinnamon chocolate filling? Who cares what they’re called? As Shakespeare said, roses are cool even if they’re not called that. That’s exactly the way he phrased it. And while I wish my name had been different, I’m still me. How many of you feel like you were given the wrong name? Names, no matter what Shakespeare said, matter. And the thing is, our parents never know how we’re going to respond to a name. I hope they do their best and hope in turn that their kids have names they love. But it doesn’t always turn out that way. As a high school teacher, I have met my fair share of odd names. I can’t share any with you, of course, but let’s just say that parents should probably think hard before naming a child after an evil dictator, giving them a name that sounds like a cuss word, or giving them a number instead of a name. Yes, that has happened. This dessert might not have a name that fits any specific category, but it’s delicious and not too unhealthy. I used whole wheat tortillas, for instance. That’s good, right? And the rest is simple. All you do is brush the tortillas with melted butter laced with cinnamon and cook them in a skillet with a cinnamon chocolate filling. 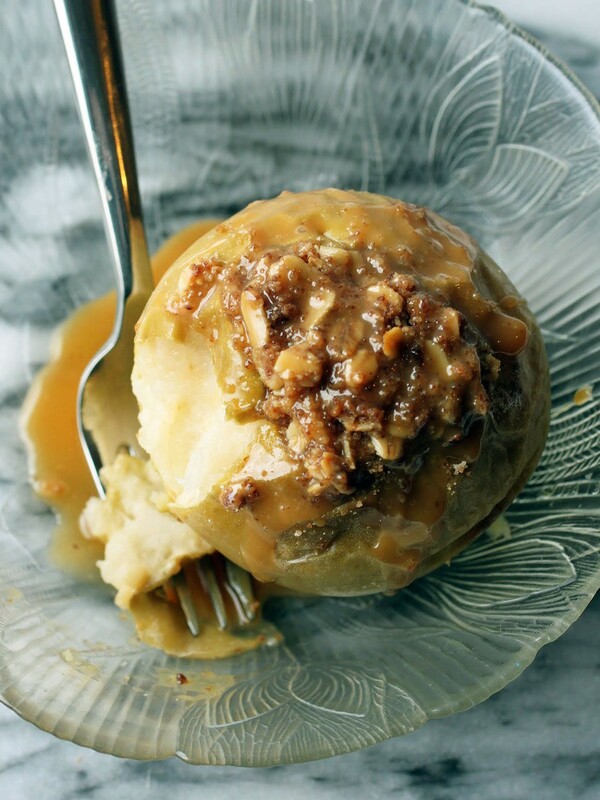 The filling is completely addictive and becomes appealingly gooey. Honestly, a scoop of ice cream on top would be perfection. Unfortunately, I ate all my ice cream before the photo shoot. That’s how I do, y’all. If messing around in the kitchen a lot isn’t your bag, these dessert quesadillas are the answer. They take minutes to put together, and they are ridiculously good. I ate mine for breakfast, but I’m a weirdo with the wrong name. Hey, if I had a different name, I’d still bake sweet desserts. But I still wouldn’t know what to call these! Make the cinnamon chocolate filling first. Pour the mini chocolate chips into a bowl. Mix in the sugar and cinnamon. Pour half (1/4 cup) of the melted butter over the mixture and stir until all the ingredients are mixed. Set aside. Place a non-stick skillet on medium heat. In a small bowl, combine 1/2 teaspoon cinnamon with the remaining 1/4 cup melted butter. Brush one side of each tortilla with the melted butter. 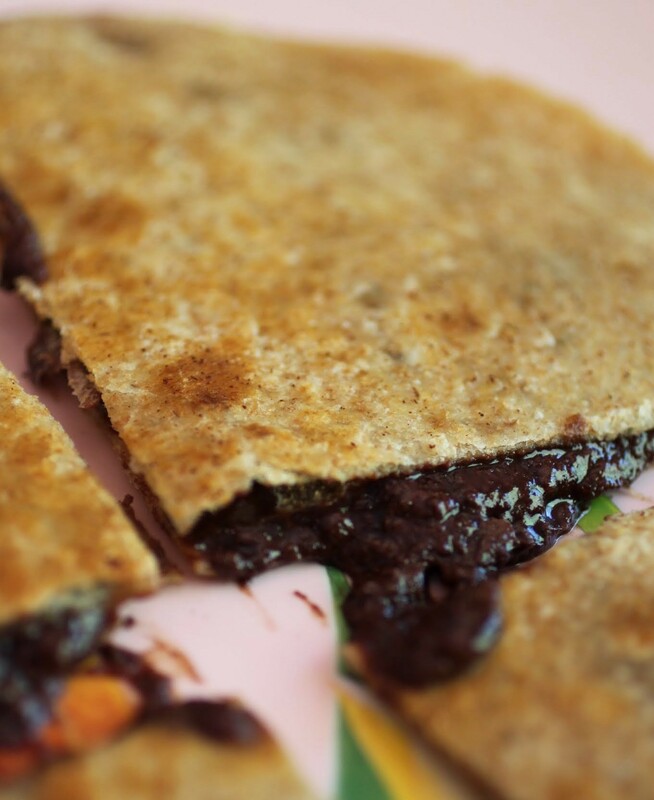 Place half of the cinnamon chocolate filling onto the unbuttered side of a tortilla, spreading it out evenly. Place the tortilla, buttered side down and chocolate side up, into the skillet. Leave it there for anywhere from two to three minutes, until the underside browns nicely. Place another tortilla, buttered side up, on top of the one in the skillet. Flip the whole thing over carefully to avoid chocolate coming out and brown the other side. Repeat the process with the second set of tortillas. 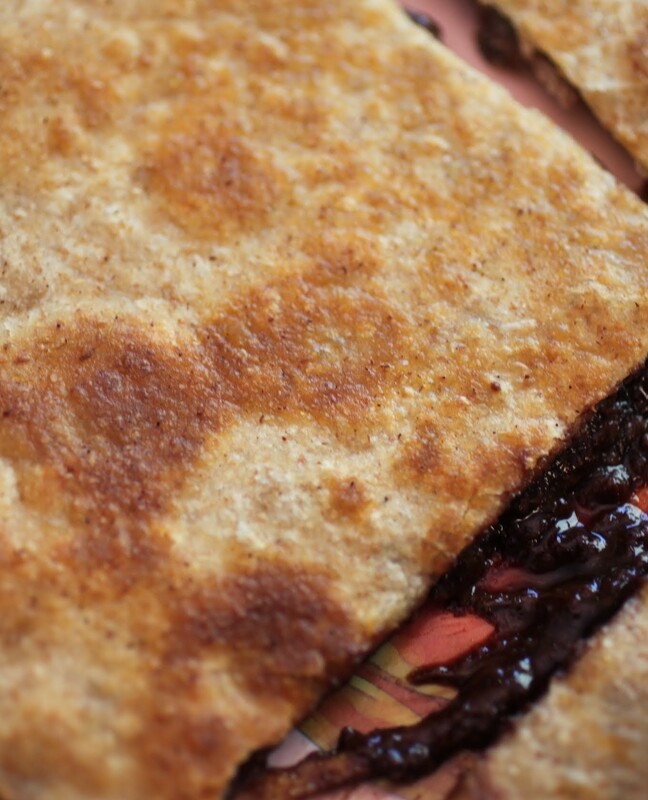 Slice each dessert quesadilla into four triangles and serve warm alone or with ice cream. Ahhhh…TGIF. Almost. Before I breeze through the last day of the week, it’s time to make some serious bread. Challah is too awesome to fly so much under the radar. 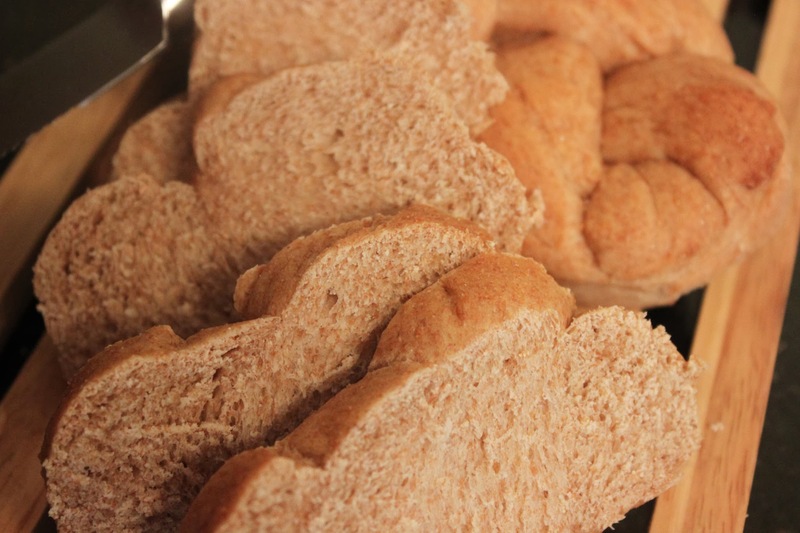 It’s traditionally an egg bread made with white flour and sugar, kind of like brioche. It makes amazing French toast. There are also water versions, calling for no egg, as well as challahs filled with anything from raisins to chocolate chips. And lately, whole wheat challah has begun to pop up in bakeries with more frequency, though it’s often put down by challah traditionalists, and who can blame them? Challah is an indulgence, a bread so good that spreading butter or jam on a slice can actually take away from the yeasty, fresh-out-of-the-oven perfection of the bread itself. I was pretty hestitant to give the whole wheat thing a try. Why fix what ain’t broke? But in a world where whole grains are healthier and white bread is just an occasional indulgence, I wanted to have my challah and eat it too. Oh what a fun quesadilla, Mir! I never thought to make a chocolate kind! Love this idea. 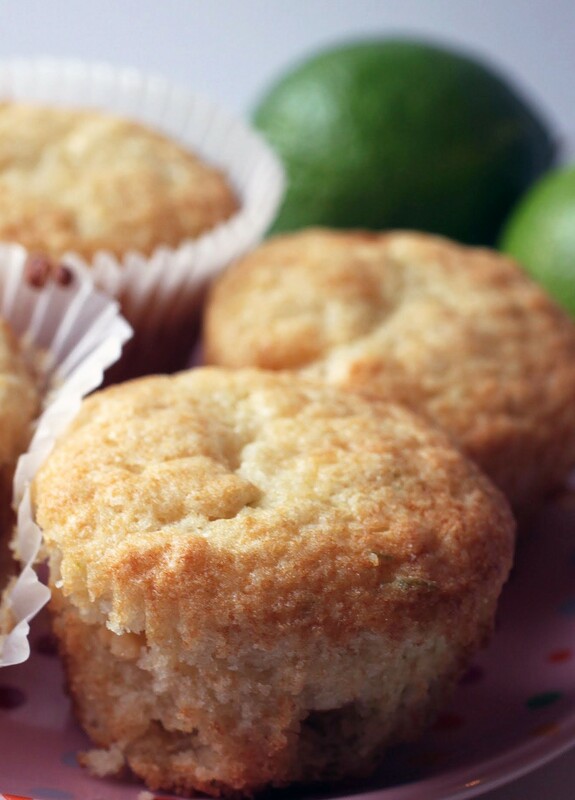 So perfect for Cinco de Mayo, or any time! I really like this recipe, I think it would be perfect to wash down all that spicy Mexican food everyone will be having this weekend! 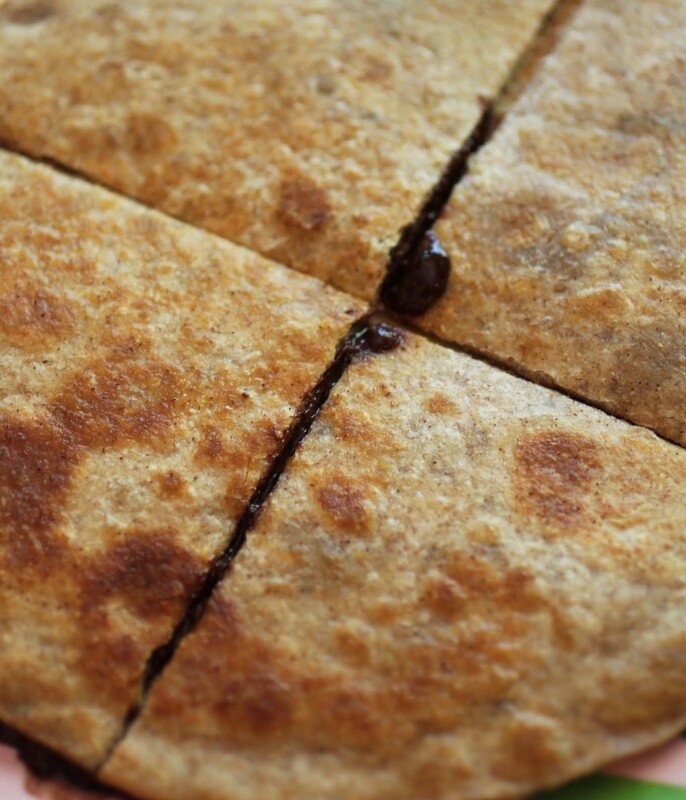 I love quesadillas, especially when they’re slathered with butter, cinnamon and CHOCOLATE! Great recipe! Thanks, Heather! I love keeping it easy and fun, right down to dessert! I hope so, Mira! I never tried it until now. It was really good! Girl, you crack me up! I love your direct quote of the bard. My parents gave me the wrong name too, so I rebelled and started using my middle name. This quesadilla looks awesome no matter what you call it! Thanks, Rachelle! I am an English teacher, ya know. 😉 We all have to call ourselves what we want. I wasn’t born “Mir,” that’s for sure! What a fun idea to make chocolate quesdaillas! Yes, chocolate works everywhere! Yum! Have a great weekend Mir! It really does, Manali. You, too! These look awesome! My name is crazy and hard to say, but I do love it, so props to my parents on that one 🙂 Chocolate and cinnamon together is so good! I’m glad you love your name, Medha! It’s a cool one! What a fun recipe!! I would love to try these right about now. I need my 3pm afternoon snack and these quesadillas sound delicious! Oh, the 3 PM snack. My weakness! I always need chocolate then too, Cyndi! LOL! Names, I remember some interesting ones. What I hated was the ONE NAME I wanted all my life for a girl (Samantha) was ruined after my first year of teaching. I never recovered until Jordan was 2 and I ran into her and she was delightful. I could use an entire quesadilla right now! I like Jordan much better, Dorothy! I hear ya, though. I worked hard to name my kids something that no student of mine was named! Associations and all…dangerous! hahaha, that post was awesome Mir! I always wonder if I picked the right names for our kids, we had SUCH a hard time with it, I think because you just want to get it right! 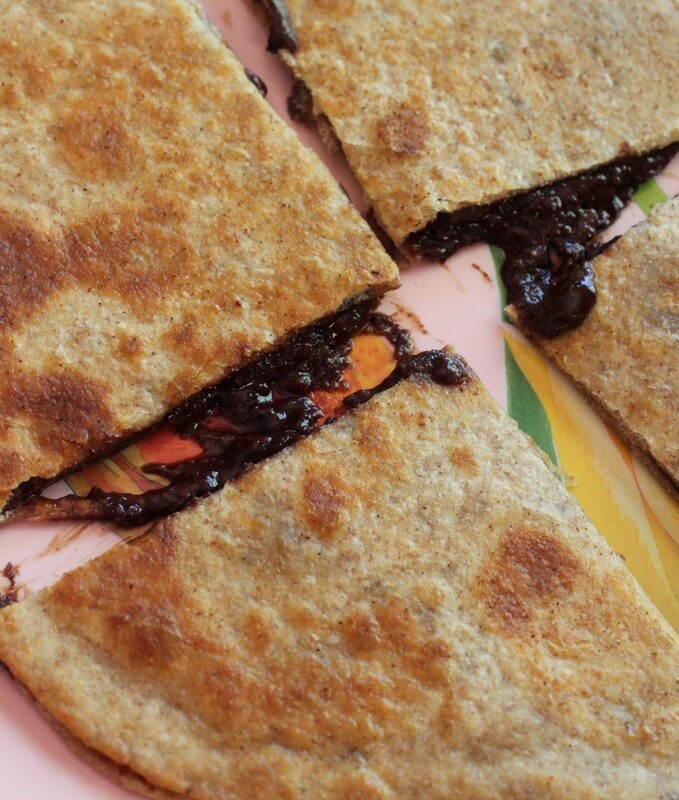 These chocolate quesadillas look amazing! Thanks, Stacey! It’s so hard to agonize over kid names!